What is a Fast Tax Refund Loan and Anticipation Loan and Where Do I Get One? 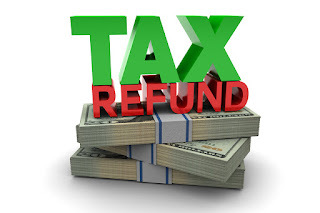 A fast tax refund loan, also known as refund anticipation loan, is an advance on your income tax refund. Instead of having to wait for your return to be processed by the IRS and delivered to you, you can access it early in order to use for emergencies or any other purpose that serves your needs best. 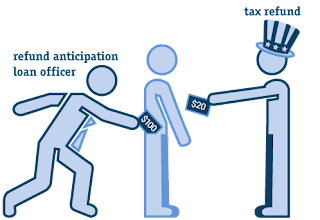 A tax advance loan from eTaxLoan.com is a lot simpler and more cost-effective than the original tax loans which were provided primarily by tax preparation companies as an add-on service to filing tax returns. 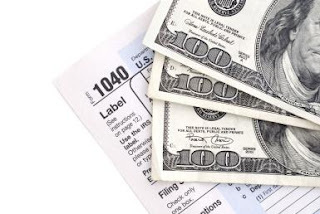 These new-style tax refund loans are not connected to return preparation, and do not even require that you prove that you’ve filed in order to apply. The newer, more convenient process is completed online, and gets you cash in hand as quickly as the next day! 1. Convenience Is King (or Queen!) Why go to a storefront during their business hours – whether or not those hours are convenient for you – and wait in line to have your taxes prepared, and spend an hour answering questions and signing forms, when you can apply online from almost anywhere? 2. The Application is Simplicity Itself. One of the greatest advantages of an online Fast Tax Anticipation Loan is that the application is so simple and so quick to complete. Rather than a long intricate application form such as you would find if you applied for a loan from your bank, the web-based form is easy, simple to complete, and tales almost no time. There will be no request for references or for you to upload financial statements or documents, including tax returns from this year or any year prior. 3. When You Need Speed. There is no loan faster than an eTaxLoan.com Fast Tax Refund. Once you’re approved, your funds will generally be released that same day, and will be available to you within one business day depending on the rules of your particular bank. 4. No Credit Check Stress! If you’ve had problems with your credit in the past, applying for any loan is an anxious experience. You just know they’re going to see that score and burst into laughter before tearing up your application and throwing it away. With a Fast Tax Refund Loan you don’t have to give that another thought – because there is no traditional credit check. Our lenders use a unique set of criteria separate from the typical credit-bureau-based qualifications. So as long as you meet the basis minimum standards, including employment, a minimum income of $1000 per month, and a US bank account, you have an excellent chance of approval regardless of any unfortunate issues lurking in your past. 5. Repayment is Automatic. When your budget is tight, forgetting to pay a bill and getting hit with a late fee is always a worry. With online tax refund loans, the repayments are drafted automatically from your checking account. You don’t have to remember to make a payment, and since the funds are withdrawn on your payday, you won’t have to worry about overdrafts either. When you need extra cash and tax season is just around the corner, it makes sense to get a tax refund loan. eTaxLoan tax loans are easy, affordable, and fast, so you can get cash to pay the bills. But what if you are going to get an extension on your taxes and pay them later? You can still take advantage of eTaxLoan tax loans and get your refund money now. 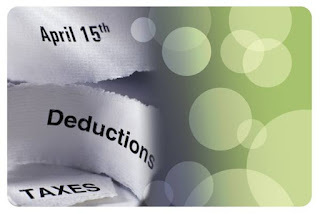 It’s always nice to be able to get taxes done and out of the way early, especially if you are waiting on a refund, but it isn’t always practical. For whatever reason, you may be facing an extension. It’s not difficult to request and get an extension, so if it makes your life easier, you should do it. But what about that refund that you so desperately need? You won’t get it until you file, but you can get the next best thing: eTaxLoan tax loans. These are easy, affordable, and quick cash loans and you don’t need to complete your taxes to take advantage of them. You can use the cash to pay your regular bills, to reduce debt, to avoid late fees on important payments, to put gas in your car, or for whatever other need you might have at this time of year. Regardless of your current tax situation, you can get eTax Loan tax loans today. All you need to do is fill out our short application. Find it online or use your tablet or phone to access our simple mobile app. Spend just a few minutes completing the application, submit it, and you can expect to hear from a lender in a minute or two. It doesn’t matter if you apply on the weekend or in the middle of the night; a lender is always ready to help you finish the process of getting your loan. Once you get approved, which is a simple step and doesn’t even require a credit check, you will get the money you’re borrowing deposited to your bank account. Getting cash from your tax loan is that easy, so even if you need to get an extension, you can relax and enjoy the refund you have coming. 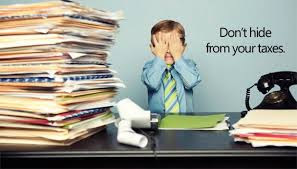 With tax time just around the corner you’re probably starting to think about the dreaded chore of filing. Whether you are the type of person who likes to get it done early and get it out of the way, or you prefer to put it off to the last minute, you can take advantage of refund anticipation loans this year. If you’re thinking that another loan is the last thing you need, think again. These sensible loans can really help you get rid of your more expensive and long term debt. At first consideration it may not seem logical to repay debt with debt, but what you may not realize about refund anticipation loans is that they are affordable. The secret is that they are small loans and short-term loans. The rate you pay is applied to only a small amount of money over a week or two. That means you pay very little in interest rates to take advantage of this source of cash. Even better, if you know a refund is coming to you eventually, you know you can afford one of these loans. Why wait another month or more to use that cash to repay expensive debt, like your holiday credit card bills? While you wait you’re only racking up pricier interest rate expenses. With refund anticipation loans you have an affordable solution to getting rid of that looming debt right now. Refund anticipation loans aren’t just an affordable and sensible way to help you pay down expensive debt; they are also easy to use. You can apply, get approval, and see cash in your account the same day if you act fast. We have lenders waiting, 24 hours a day, to help you get approved and to make sure the cash gets deposited to your bank account. All you have to do is get online and complete the application. It couldn’t be any easier, and you don’t even have to leave the house. Just turn on your computer or pull out your smartphone to get started. Approval takes just a minute too. You won’t regret taking the few minutes to apply for and get refund anticipation loans this year. Doing so means you have an affordable and convenient way to rid yourself of that stressful, expensive debt.